Between spending ungodly hours prepping my house for sale, and without a book being released in the fall, I haven’t felt very authorly lately. 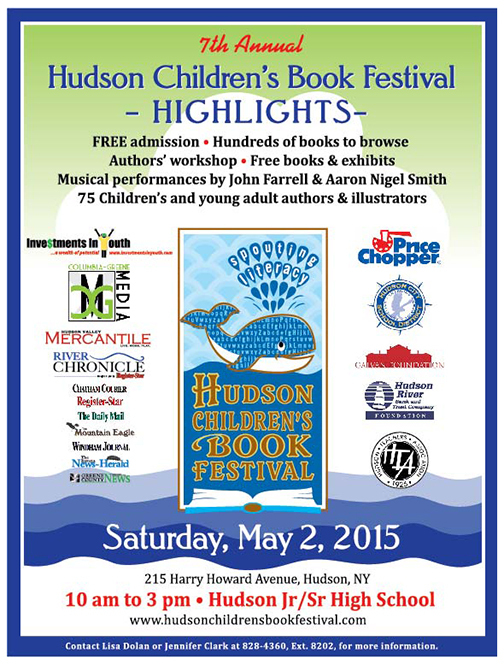 However, the Hudson Children’s Book Festival this past Saturday helped alleviate that feeling. I had only heard good things about the festival, I didn’t know anyone who had attended. But still, I applied over the winter and was accepted, and then didn’t think too much of it because I had so much time to prepare. And then spring arrived at it was time to drive an hour south and hang out with the Hudson community and the authors and illustrators they had brought in. So, the night before, I checked the site, and was wowed by the names in attendance. Go, Hudson! When I arrived, the school campus was already buzzing with activity and I quickly grabbed my gear and found my table. And surprise, surprise, I was seated next to the amazing Jennifer Donnelly. You know, the author of A Northern Light and Revolution and the The Waterfire Saga series, among others. Yeah, her. I immediately turned all fanboy and gushed about her work, which I’ve loved for a while. Then I got my table set up and the floodgates opened. And she was right. From 10-2 there was a steady flow of people coming through the doors. And they BOUGHT books. It was astounding to see. And all the orders for all of the authors were handled by a local Indie bookstore, The Spotty Dog. That alone is an amazing feat but combined with the organization of ordering for each of the over 75 authors, it’s truly remarkable. Additionally, there was an excellent mix of girls and boys. Readership among teens, across gender lines, in Hudson, is certainly not an issue. And they all had preferences about the books they enjoy, the genres, and why. It was so amazing to hear a tween riff on the importance of Fantasy YA, while her older sister did the same about Contemporary Realistic. There are some amazing things happening both inside and outside the classrooms for these kids, and it is precisely these kinds of events that keep them coming back for more. ← Home prep, just like revision.